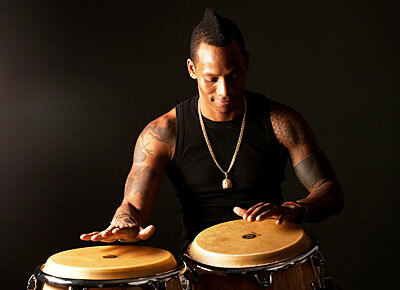 Cuban-born percussionist Pedro Pablo “Pedrito” Martinez and his international bandmates bring their unique blend of Latin jazz, timba, gospel, guaguanco, blues and classical music to Lawrence University’s Warch Campus Center Wednesday, April 11 at 8 p.m. in a Lawrence World Music concert. Tickets, at $10 adults; $5 for seniors/students are available through the Lawrence Box Office, 920-832-6749. Known for both his beautiful voice and his exceptional percussion skills, Martinez will be joined by Cuban pianist and vocalist Ariacne Trujillo, Venezuelan-born bassist Alvaro Benavides and Peruvian-born percussionist Jhair Sala. They have performed together since Martinez formed the group in 2005. Winner of the 2000 Thelonius Monk Award for Afro-Latin hand percussion, Martinez has recorded or performed with such diverse musical luminaries as Wynton Marsailis, Bruce Springsteen, Paquito D’Rivera and Sting. The group’s self-titled debut album earned a Grammy Award nomination and was among NPR’s “Favorite Album” in 2013. Their second album, 2016’s “Habana Dreams,” was the top choice in NPR’s Jazz Critic Top Jazz Albums that year. Embracing new music at its highest level, Scotland native Colin Currie brings his dynamic percussion talents to the Lawrence Memorial Chapel Friday, March 30 at 8 p.m. in the third concert of Lawrence University’s 2017-18 Artist Series. Tickets for the performance, at $25-30 for adults, $20-25 for seniors, $18-20 for students, are available through the Lawrence Box Office, 920-832-6749. Percussion virtuoso Colin Currie performs March 30 in the Lawrence Memorial Chapel. A percussion virtuoso, Currie has established himself as the soloist of choice for many of today’s foremost composers, especially the innovative Stephen Reich, the father of minimalism. He has had the honor of performing premieres of works by nearly 20 contemporary composers. 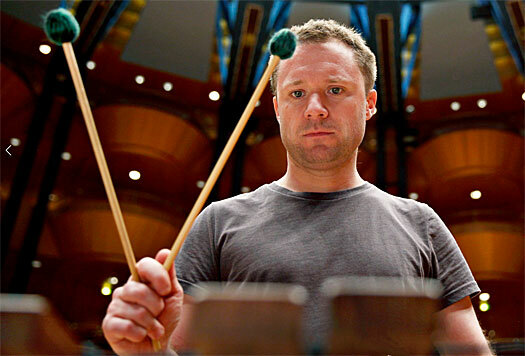 Growing up, Currie played principal timpani and percussion with both the National Youth Orchestra of Scotland and the European Union Youth Orchestra. He has been recognized with the Royal Philharmonic Society’s Young Artist Award in 2000 and its Instrumentalist Award in 2015, was a BBC Radio 3 New Generation Artist between 2003-2005 and received a Bortletti Buitoni Trust Award, which honors performers of exceptional quality and musicianship, in 2005. Currie launched his own eponymous record label last fall and released its first recording, Steve Reich’s “Drumming,” earlier this month. He has held an appointment as a visiting professor of solo percussion at London’s Royal Academy of Music, is an Artist-in-Association at London’s Southbank Centre and is in the final year of a three-year Artist-in-Residence appointment with the Oregon Symphony Orchestra. 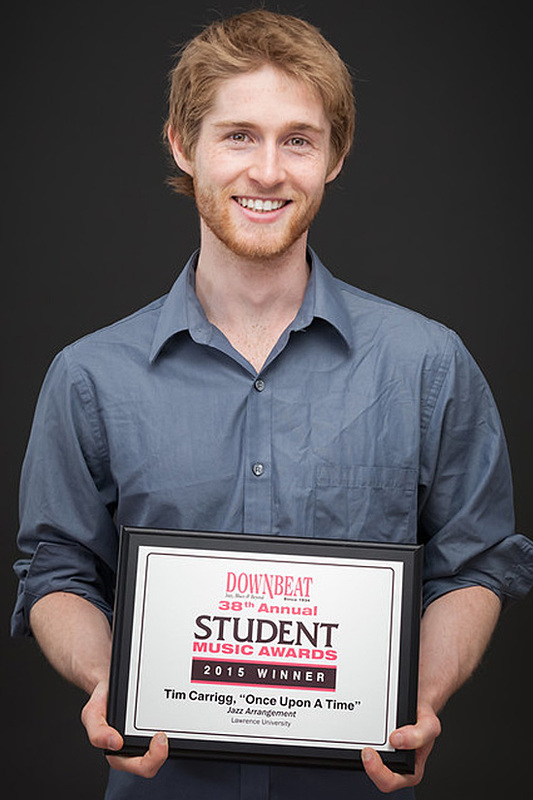 What’s better than winning a Student Music Award from DownBeat magazine? How about winning two. The Lawrence University jazz studies and improvisation department has double reason to celebrate after DownBeat’s announcement of the winners of its 38th annual Student Music Awards. Lawrence claimed a pair of honorees — an individual and an ensemble — in the magazine’s yearly salute to the best in student music-making. Tim Carrigg was one of two winners in the college undergraduate jazz arrangement category. Tambo Toké, Lawrence’s Afro-Cuban percussion group, was cited for outstanding performance in the college undergraduate Latin Jazz Ensemble category. The 2015 SMAs, announced in DownBeat’s June edition, are presented in 13 categories in five separate divisions (junior high, high school, performing high school, undergraduate college and graduate college) are considered among the highest music honors in the field of jazz education. “When I started arranging the piece, it turned out much, much different than the original tune, so I just renamed it,” said Carrigg, a music theory/composition major with a jazz emphasis. The SMA was a well-earned reward for Carrigg, who began working on the piece in the fall of 2013 and once spent 40 consecutive hours hunkered down in his room notating the piece. “Whenever you’re composing anything, you put in a lot of work, literally hundreds and hundreds of hours and at the end of the day, are you going to create something that is really great? Hopefully,” said Carrigg, whose compositions will be showcased in a jazz recital on May. 31. He recorded “Once Upon a Time” in the spring of 2014, using a 17-piece band he recruited from members of the Lawrence University Jazz Ensemble (LUJE) and Lawrence Jazz Band. Guitarist Sam Genualdi and drummer Dan Reifsteck are featured soloists on the recording. Carrigg says composition has been a part of his entire musical life, but he says his “serious composing” phase began three years ago when he joined the Lawrence composition studio. Carrigg credited the late Fred Sturm, an award-winning composer and former director of Lawrence’s jazz studies program and Patty Darling, a DownBeat SMA jazz arrangement winner herself as a Lawrence student in 1984, for their mentoring on the project. Tambo Toké, Lawrence’s 17-member Afro-Cuban percussion ensemble, earned “Outstanding Performance” recognition from DownBeat magazine in its 38th annual Student Music Awards competition. The SMA for Latin Jazz Ensemble is the second major honor in the past year for Lawrence percussionists. In 2014, the Lawrence University Percussion Ensemble (LUPE), of which Tambo Toké is a subset, won the Percussive Arts Society World Percussion Ensemble Competition and was a featured performer last fall at the PAS International Convention in Indianapolis. 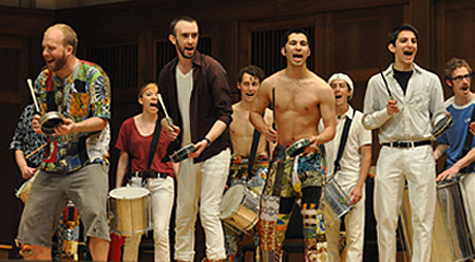 The 17-member Tambo Toké, which includes non-percussion majors, is led by student director Eli Edelman, who submitted a video tape of a 30-minute medley of traditional Afro-Cuban drumming and songs that he arranged for his senior recital in February 2014. “It was obvious to me the performance was strong enough for DownBeat to consider it in their annual national student competition. 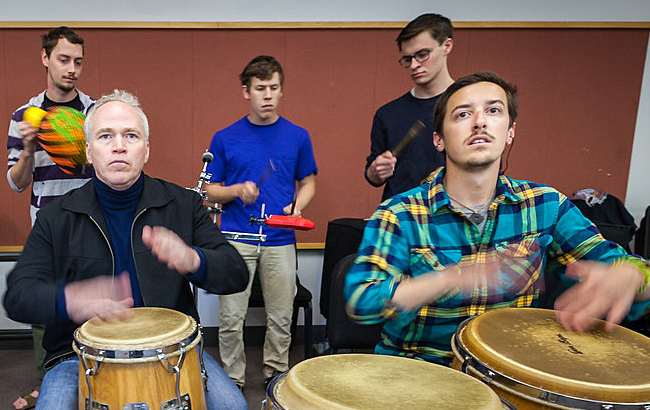 I know there are very few schools that are performing this style of Cuban music in this country,” said Dane Richeson, professor of music and director of Lawrence’s percussion studio. Tambo Toké grew out of a presentation jazz studies instructor José Encarnación did three years ago on Afro-Cuban music, specifically Rumba. With Edelman leading the ensemble, Richeson decided to incorporate it into his world music curriculum, expanding the repertoire to include other Cuban traditional music such as Arara and Bata. “The fact that our students are open minded enough to learn, respect and embrace music and life from another culture is what makes Tambo Toké special and worthy of national recognition,” said Encarnación. Edelman, a senior from Hoboken, N.J., brings the experience of two recent visits to Cuba to his position of director of Tambo Toké. With the support of some Lawrence research grants, including a Melon Senior Experience grant, he was able to spend two months in 2013 immersed in the Afro-Cuban folkloric music scene of Havana and Matanzas. “Almost every single day I had a two-hour private lesson in the morning with one teacher, a two-hour private lesson in the afternoon with another teacher, and then I’d go find live music performances to watch in the evening,” said Edelman, a double degree candidate with majors in percussion performance and history. As its student director, senior Eli Edelman (front row, right), helped Tambo Toké earn a DownBeat award in the Latin jazz ensemble category of the magazine’s 2015 student music awards competition. Richeson, who has used several sabbaticals to study music traditions in Ghana, Cuba and Brazil, says it is crucial for 21st-century percussion students to have both exposure to, and experience performing, the music traditions rooted in West Africa. Since DownBeat launched its student music awards competition in 1978, Lawrence students and ensembles have won a total of 26 SMAs, including six in the past five years. 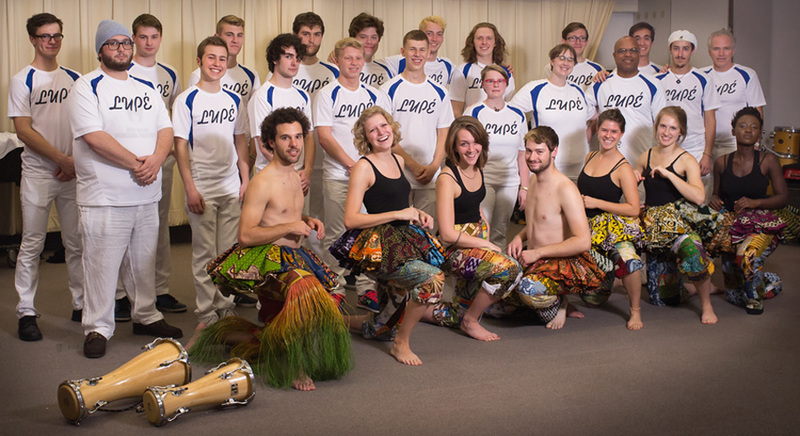 Percussion enthusiasts of all kinds attending this year’s Percussive Arts Society International Convention will be treated to a performance by the Lawrence University Percussion Ensemble (LUPÉ), which earned a special invitation by winning the organization’s 2014 International World Percussion Ensemble Competition earlier this year. Twenty-three members of LUPÉ will share the spotlight when they take the stage Thursday, Nov. 20 in Indianapolis, Ind., as one of the three-day conference’s featured performers.This will be LUPÉ’s second appearance on the international stage under the direction of Professor of Music Dane Richeson. LUPÉ previously performed at the international conference in Phoenix, Ariz., after winning the 1995 PAS collegiate percussion ensemble competition. LUPÉ — featuring the Sambistas, a Brazilian drumming corps, Kinkaviwo, a Ghanaian drum and dance group and Tambotoke´, an Afro-Cuban group — was selected the winner of the PAS-sponsored World Percussion Competition from among submitted video tapes. The competition is open to high school and college/university ensembles performing non-Western percussion-based music. Lawrence’s submission was from its March 2014 concert in the Lawrence Memorial Chapel. Richeson called the competition victory “a testament to the dedication and hard work our students put into learning these music traditions from Brazil, Ghana and Cuba. The Percussive Arts Society International Convention is the world’s largest percussion event, featuring more than 120 concerts, clinics, master classes, labs, workshops, panels and presentations. Ensembles from the University of Kentucky, Oklahoma State University and Yale University will join LUPÉ as performance winners from other PAS-sponsored competition categories.